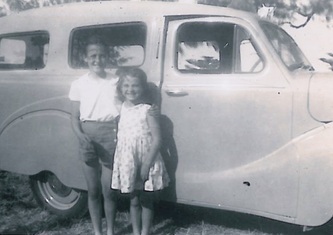 Mum and Dad (Mavis and Bryan Hannagan) built the house at 37 Grand Parade and moved into it in September 1949. Dad was still at University after coming out of the army. 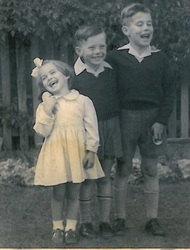 They already had two boys, Terry (3 1/2 years) and Bernard (1 1/2 years) and Mum was pregnant with me (Moira) who was born in March 1950. In those days in St John’s Wood there were all young families starting their lives and there was a great sense of belonging and togetherness. The Glynns lived opposite and were a constant source of wonderment to us as children because of the number of different animals they always seemed to have in their garden. “Aunty” Brenda was always teaching us about the animals and birds, and she was always so refined which was very different from the rough and tumble of our household of six children. Bill and Joyce Byrnes had bought the block of land next door on the corner of Grand Parade and Buckingham Street and Bill built the house himself. 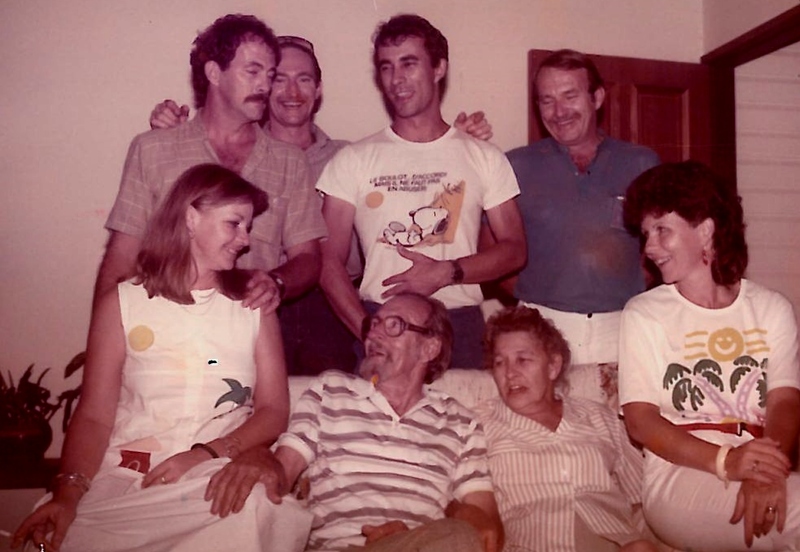 The Bennetts lived on the other side, Lila, Bill and their son Wayne. Bill was a taxi driver and he and Dad would share a beer over the back fence of a Sunday afternoon. The Claytons lived over the back fence, Bill, Jess, and their children Marie, Leslie and Barbara. Dad graduated from University in 1952 with a Bachelor of Surveying (some bachelor – with three kids!!!). Terry had started school at Mater Dei in its inaugural year and Mum would walk him to school with me in a pram and Bern tagging along. The walk home was always a lot longer not only because Bern would get tired but also because there was always someone to have a chat along the way. The rumble of the original bridge could be heard as the bus came over which would signal Dad’s return from work and us kids would rush out to the end of the road to the top of Buckingham Street to wait for him coming up the road. Before that old bridge was replaced, if there had been rain overnight, we would check to see if the milk was at the door, because obviously if there was no milk the milkman hadn’t been able to get over therefore we couldn’t get out and could have the day off school. As the years went on more kids arrived – Kevin in September 1953, Chris in September 1955 and Mary-Jude in December 1957. Dad was appointed as a Surveyor in PNG from 1957 for three years. Mary-Jude was born at the Ashgrove Private Hospital (as we all were) while on leave from Moresby and we returned to PNG when she was only two months old. During our absence the house was rented to the Maunder family who I believe fitted into the community of “The Woods” very well. We returned to Grand Parade in 1960 and it seemed we just took up where we had left off. Life in St John’s Wood was wonderfully carefree and safe, so much so that we could spend just about all day during the school holidays, with school friends and neighbourhood kids “down the creek” coming home only for lunch and then head back out again. The only rule was we had to be back home before 5.00pm. I introduced Mary Jude’s three kids to the fun of the creek in later years and they even had special creek clothes and shoes. Mum had a special whistle to call us home from wherever we were which was ignored at our peril. Right up to the end of Mum’s life Terry would signal his arrival at Grand Parade with the same whistle. As the three older ones reached teenage years, along with Rhonda and Ian Griffiths, we would arrange “midnight feasts” in the cottage at the back of the Grifffiths’ property. Of course we thought we were incredibly smart and that no one knew what we were doing. It was many years later that we found out that Max Griffiths would ring Dad and let him know that we were there and then ring again to say we were on our way home!! In 1980 our home was completely destroyed by fire, but the amazing love and support from the community totally overwhelmed our family, particularly the efforts of our wonderful neighbour “Aunty” Brenda Glynn. Another occasion in 1994 when the community of “The Woods” prevailed was the efforts of numerous residents not to lose the place name of St John’s Wood. A petition to Council was taken around and presented, the result was that the sign at the end of the bridge was erected. Note: to read more about the Grand Pde neighbours, please click here.